Sauces and Gravy Are Delectable In Your Crock Pot! You don't have to give up sauces and gravy for the convenience of a crock pot! You can still make them. Pour off the liquid at the end of cooking. Thicken it with flour or corn starch. Crock pot cooking doesn't make a difference in the ratio that you use in a stove-top or oven recipe. Use 1 tablespoon corn starch OR 2 tablespoons flour to each cup of liquid. 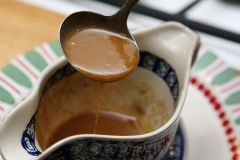 Another way to add creaminess to your adapted crock pot recipe is to use condensed cream soups or packaged sauce mixes. Do not use milk, cream, or sour cream. They curdle and separate when cooking for a long period of time. But if you choose to use milk or cream, wait to add them until the last 30 minutes of cooking time (Low) or just 10 minutes (High). Cheese can be stirred in at the end of the cooking time. You can spray the inside of your crock pot with non-stick cooking spray, just the same as you would spray any dish in which you're baking a casserole. You will enjoy easy clean up!